Finding Kat Heckenbach: "The Artist" in Print!!! My short story "The Artist" can be found in the pages of Beyond Centauri's July 2010 issue. 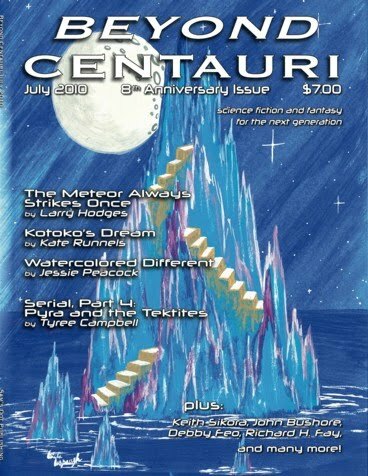 Beyond Centauri is a "magazine of fantasy, science fiction, and ewww-gross for younger readers [for readers of all ages], published quarterly on the 1st day of January, April, July, and October. Beyond Centauri publishes short stories, poems, illustrations, puzzles, articles, and movie reviews." "The Artist" is a story that was originally published online in Mindflights, which has recently closed it's doors. I am thrilled to see the story getting a second chance, and in a print magazine! It's a supplement to Finding Angel--a bit of back story about one of the characters. To order a copy of the July issue, or a full subscription to Beyond Centauri, click here. Ruth Naylor: What Might Force? Kat this is so exciting!! It's great to see that "The Artist" found a reprint home. Also, MindFlights has not closed it's doors!